Our USPS approved Certified Mail Envelope include ‘ERR’ – Electronic Return Receipt. Send Certified Mail using our USPS approved bright white envelope with the distinguished USPS Certified Mail automation, in-route tracking and Electronic Return Receipt to show delivery confirmation. 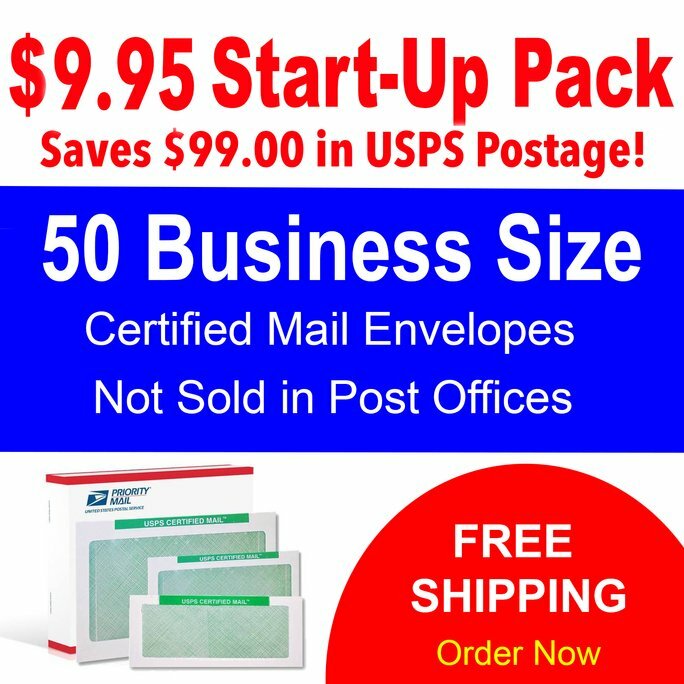 Free web access to print, address and track your USPS Certified Mail Letters. No special labels are needed. Our web software will address, track, print article numbers, bar codes, and the legal proof of mailing manifest PS-3877 including the Green Electronic Return Receipt to show Delivery Confirmation. Each Certified Mail Envelope includes ERR – Electronic Return Receipt. If you use the USPS Green Card for proof of delivery, you will save the $2.35 Green Card postage. Electronic Return Receipt – ERR provides proof of delivery information authored by USPS when each Certified Mail Letter is delivered. Our USPS delivery and trackling information also can provide ’in-route’ USPS letter tracking electronically in your online account. We keep a historical copy of your mailing information for up to 7 years. Monday – Friday (Excludes Holidays). After 2 PM orders are shipped the next business morning. We gladly accept Visa, MasterCard, American Express, Bank Wire, ACH, Check and eCheck. We ship anywhere in the Continental United States and reserve the right to choose the delivery company of our choice. We ship orders using USPS, UPS and FedEx to meet your delivery requests. Electronic Return Receipt – ERR is proof of USPS letter delivery authored by the United States Postal Service (USPS). This service includes USPS Confirm ‘in-route’ tracking scans and a 7 year storage archive of your mail history.